After stating the authority and the power and the origin of this Our Republic (“WE the People’), the Preamble to the Constitution sets forth its six (6), purposes or principles of Our Republic. The following is the first purpose or principle. “In order“ is, in contrast, to disorder. Order is, the arrangement or disposition of people or things in relation to each other, according to a particular sequence, pattern, or method. It is, an authoritative command, direction, or instruction. “to,” from the Greek preposition pros is, to, towards, or with a view towards. “form” is, the visible shape or configuration of something. It is a mold, frame, or block in or on which something is shaped. “a” as a letter of the English and the Greek alphabet (Greek- alpha), is, the first letter, a beginning. As an article, “a” (indefinite) it is defined: One; any indefinite example of; used to denote a singular item of a group. Note: The word “the” is NOT used which would suggest something definite as, “The United States of America.” This order was to form a beginning, something new; something in process, something in progress, and something which can be changed, improved upon, altered, amended and even eliminated if according to the authority of, WE the People, as we grow and as WE deem necessary. “more perfect?” – Can something which is perfect become more perfect or less perfect? NO it cannot! This strange usage or combinations of words should arrest our attention. Can our attention be arrested? “Arrest our attention” and our three words here, “a more perfect…” together form each, a figure of speech. A figure of speech is a legitimate grammatical usage of words that are truer to truth than the literal statement of fact. Figures of speech are used for emphasis, to emphasize someone or something. Have you ever heard or read, “Practice makes perfect?” But would not one have to start with perfect practice? I heard a child spokesperson for a recent adoption campaign say, “You don’t have to be a perfect person to be a perfect parent!” Do either of these two line make any literal sense whatsoever? Not without understanding figures of speech! “In order to form a more perfect Union” is, a figure of speech. This particular figure of speech literally emphasizes the word “perfect.” Figuratively, it makes the word “perfect” truer to truth than the literal statement of fact. This figure is used as a goal to strive for, a viewpoint to ever reach for. It is NOT a final destination to be reached by such finite and imperfect people as all of humanity in this life, but a continual reaching for excellence. Only God (the laws of Nature and Natures God) is perfect and only He or it by our willingness to follow Him or its principles, His Word (or the natural law principles), and His principles can perfect us. “More pefect” removes the previous impediment of the former or first Constitution, the Articles of Confederation. It removes the inability to grow and change by removing the word “perpetual.” One cannot excel or strive for perfection, if they are locked into perpetuity of an unchanging system! One cannot excel or strive for perfection, if they are locked into perpetuity of an unchanging system! When the greater came (This Constitution on March 4th, 1789), the former (Articles of Confederation), the lesser was terminated. In conclusion, please note that this preamble and this constitution omits the word “perpetual” which was part of the Articles of Confederation. If something is perpetual, it continues. It was and remains the ever pursuit of excellence or Our lifelong journey in always seeking to excel. 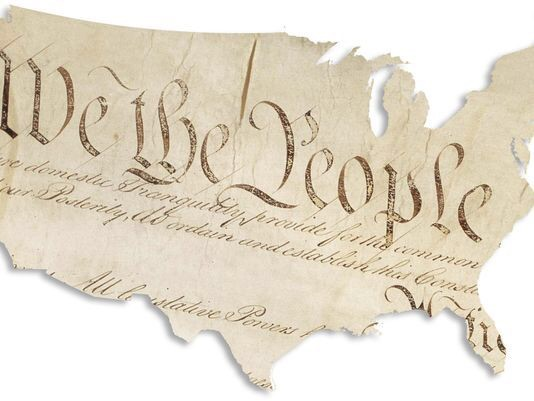 This constitution was NOT intended to be necessarily “perpetual,” but to grow as WE the People grow and deem it necessary to change or abolish it and therefore, it was envisioned as a continual pursuit towards, “a more perfect Union,” among us, WE the People. Please note, it is my purpose and intent to repeat the entire Preamble word for word throughout this series. Perhaps WE all will have it memorized at its conclusion and keep it! This entry was posted on May 31, 2017 at 8:47 pm and is filed under American, Declaration Of Independence, Freedom, Liberty, Life, Pursuit of Happiness, Republic, RESET, Sovereign Rights, US Constitution, USA, WE the People. You can follow any responses to this entry through the RSS 2.0 feed. You can leave a response, or trackback from your own site.